Post Update for 2012: Ah yes…Webcam Max, undoubtedly one of the best virtual webcam applications out there. 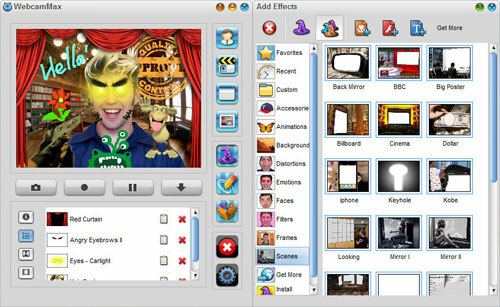 I use many applications to help produce my web show Landor Industries Live. Such as IRC clients and some other virtual webcams. But nothing comes close when it comes to Webcam Max. This program has all you can think of and more! As if I hadn’t said it enough, Webcam Max is a virtual webcam program that allows you to be creative with your video productions. You are able to add different effects to your videos such as different signs that say you’re away or busy as well as the ability to apply backgrounds. You can also add a special touch to your videos by type up your own custom text and displaying it on your own video as well as dozens of other features including PIP (Picture In Picture) display, the ability to show movies and much, much more! It doesn’t get any better than Webcam Max when it comes to using virtual webcams on Windows based computers. There are some available for OS X, but when it comes to windows, Webcam Max is you best bet! I’ve heard all this stuff about Webcam Max, but I want to know where I can get it? That’s an easy one. If you would like to try out the software for 30 days or even to order the software license, head over to the Webcam Max website. There you will be able to access Webcam Max resources and other cool stuff. So what are you waiting for? Head on over to the Webcam Max website to start your own Webcam Max experience! Once you get it, make sure you tell your friends all about it. You never know! They may be interested too! I have to say, personally, the software is pretty good. It has everything you need for a basic web show. In the future I hope to see RSS capabilities implemented, an extra PIP function, and a temperature option. These are my only quips I have with it. If those options are to be available in the future, then I would be satisfied. Webcam Max is very good software and gets the Landor Industries Live Techtronica seal of approval! If you liked this review, you should head over to the Webcam Max website and get the program for yourself and see how great it is! screen capture recordingsoftwareTechtronicavirtual recordingWebcamWebcam MaxWebcam Max reviewwhat is virtual recording?What is webcam max? Previous Previous post: Can Multiple Monitors Increase Productivity? Next Next post: What Kind of Wireless Networking Router Do You Use?